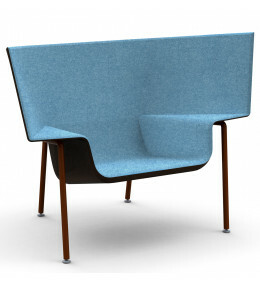 Doshi Levien is a London based design office led by Jonathan Levien and Nipa Doshi, established in 2000. Their work celebrates the hybrid and explores the coming together of cultures, technology, story telling, industrial design and fine craftsmanship. Nipa’s refined and astute visual direction is combined with Jonathan’s precision and tenacity as an industrial designer: they make their own rules that are based on extracting as much richness as possible out of an idea. The studio gives expert advice to global brands on cultural and social insights, leading to design opportunities for the emerging economies. Doshi Levien Studio works internationally for a broad range of clients who are leaders in their field. Capo Armchair and Footrest are modern lounge seating in leather, faux leather, felt and Alcantara.